A crunchy and savory crostini is a perfect compliment to homemade soups and salads. 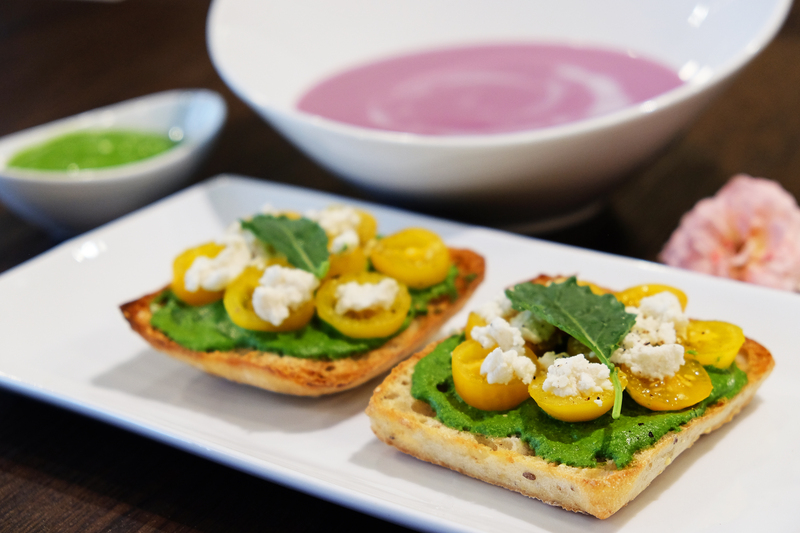 This vegan crostini is garnished with homemade kale pesto, sweet cherry tomatoes, black pepper, and topped it off with vegan ricotta cheese. This kale pesto is so fresh and easy to make; we love utilizing this pesto in our sandwiches and pastas. The baby kale, garlic, cashews, lemon juice, salt and pepper combine for a creamy pesto without use of any additional oil. Try this delectable crostini with our wild mushroom soup! 1. Split the multigrain ciabattas in half. Brush them with olive oil (optional). 2. Toast the bread slices until crisp. 3. Spread the prepared kale pesto on them. 4. Add the cherry tomatoes. Sprinkle ground black pepper and vegan ricotta cheese. 5. Garnish them with micro greens or baby kale leaves.